Call the waves to kiss your feet – Located closely to the Jagannath Temple, the Puri Beach is one of the cleanest beaches in India. From pilgrims to tourists, fishermen and locals, you find people from all walks of life strolling here. There are some small shops which are filled with souvenirs and food items near to the beach. 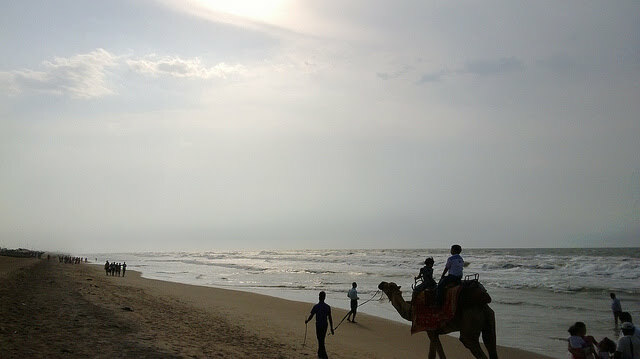 If you are making a Puri hotel booking, make sure to find accommodation near the Puri Beach as the view here is splendid. There is a local story in Puri that if you give a call to the waves they will come rushing to wash your feet. Get soaked in heritage and spirituality at Jagannath Temple– One of the four main Hindu pilgrimage spots in India, the Jagannath Temple is the earthly abode of Lord Vishnu. The God is found here staying in his human form of Krishna accompanied by his brother Balarama and sister Subhadra. The idol has huge eyes and stumps for hands and there is a local story behind that too. Every year the Jagannath Rath Yatra is organised in July which is attended by lakhs of Devotees. When here, do not miss out on the delicious prasadam which is cooked every day for the people visiting the temple. Learning sand castle making– The name Sudarshan Patnaik is synonymous with the sand art creations in India and across the world. You can also learn the unique art form, that too from the great artist himself, in Puri. His creations on Puri Beach have been extraordinary. And, he organises an open air workshop at an institute, which is located at the stretch between Hotel May fair beach and Panthanivas, to spread this art form. Shop for local goods at Anand Bazaar– Just right next to the Jagannath temple is the Anand Bazaar where you can shop for almost anything. From clothes to idols and local sweets, you can find a wide variety of irresistible things here. While you’re in the shopping spree, don’t miss to dig into an Oriya thali at any of the road side hotels. Visit Raghurajpur crafts village – For the art lovers, Raghurajpur crafts village is a haven. Located only 14 kilometres away from Puri, this village has a huge collection of Pattachitra paintings, which is a famous local art form of Odisha. These paintings are usually done on dried pieces of leaves or cloth and depict mythological scenes or pictures of gods and goddesses. Not only that, you can even buy wood carved paintings, palm leaf engraved art, and tussar paintings, which are a speciality of the villagers residing here. Puri is a culturally endowed location and a Puri trip is sure to bring you close to cultural roots of India. To avoid any last minute rush, make sure to do your booking in advance for hotels, there are plenty of luxury, budget and cheap hotels in Puri. This would also ensure that you end up with a good deal with one of the best hotels available. To experience the fervor, you can visit the city during the Rath Yatra. Puri looks amazing! Have you ever travelled there?